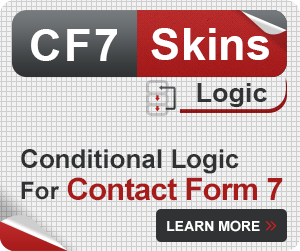 Receive monthly advice, tips, tutorials and news from Contact Form 7 experts. Please help us to understand how people use CF7 Skins by completing this Quick Poll. 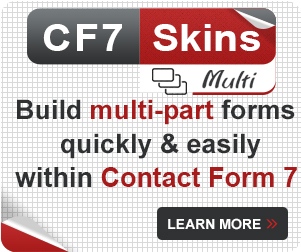 If you’ve bought a CF7 Skins Add-on, we have a Support Team available help you to solve your questions and problems. Sign me up to receive monthly advice, tips, tutorials and news from Contact Form 7 experts. This plugin rocks! I’m building a new website for the company I work for and I’m a beginner. The CF7 Skins templates were super easy to figure out and do everything I need them to, seamlessly. So far I’ve been able to build a customer survey, a sales quote form and an employment application that all work perfectly! Thank you. I am a return customer and have purchased a few CF7 Skins. Recently I had an issue and the team was quick to send me a custom fix so plugin would remain compatible with my WordPress theme. Excellent service! Contact form is a must for my websites success. I love CF7 Skins. I’ve been using it now on a number of lead generation websites I’ve built where a well-designed form is key to getting customer data submitted. We are now using it on Expert Pension Claims with great success. It’s easy to use, I can customise it further, and the support I’ve received has been excellent. Get this plugin, you won’t regret it. It will save you masses amount of time messing around with style sheets and the complications of making a Contact Form 7 look good! 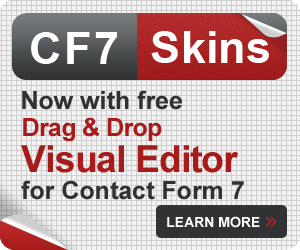 After trying CF7 Skins for one website I cannot do without it for the second site I’m working on as a volunteer. Very easy to work with, it’s not complicated to follow examples already done and modify for my need. It’s simple enough that I didn’t need help from support but they were very fast to fix an issue with my order when I upgraded. Very pleased with all of it! I manage websites. I recently migrated a Joomla site to WordPress. There was an online referral form which needed to be rebuilt to work with the newly designed site. My design and coding chops were not quite up to the task. CF7 Skins was perfect. I set up a multi-page form with a little assistance from tech support. The designer was wowed by the results. Tech support was responsive and spot on. The plugin itself was a dream to use. I look forward to the next time I set up a form. 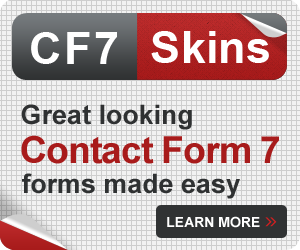 CF7 Skins has proven to be one of the best and easiest to use WordPress plugins, which greatly enhances the functionality and user friendliness of Contact Form 7. I can’t rave enough about this plugin! And the technical support for CF7 Skins is fantastic! I had a minor issue integrating CF7 Skins with Ubermenu and the CF7 Skins support team did an incredible job resolving this matter within a few hours. 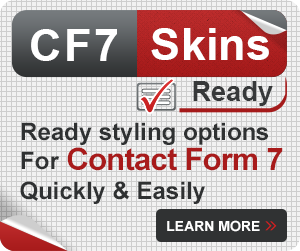 I strongly recommend CF7 Skins to any WordPress site developer who wants to give their contact forms an amazing professional appearance and superior functionality! If you have a current license you can post your questions to our Premium Email Support. If you want help with the free version you will need to use the WordPress Support forum. This is community based support offered by other CF7 Skin users (we visit the forum intermittently to assist with plugin bugs only). Sign-up now - free Tips from Contact Form 7 Experts!